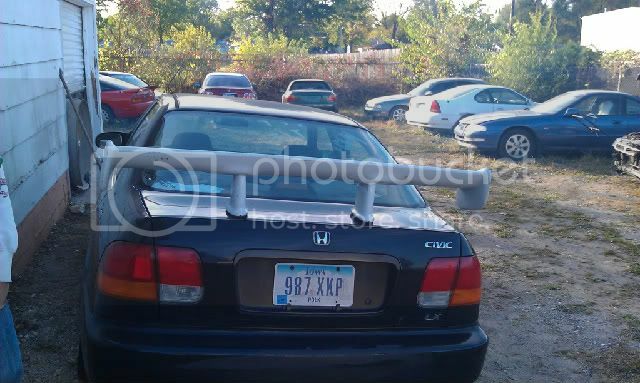 Someone with a SSBP Integra, with a Mugen Gen 1 spoiler... was clean as f*ck saw some girl driving it but maybe it was her bf's car? Silver Skyline GTR R35 with black wheels in Ames. It was parked on ISU campus. Anybody know him/her? "Drag racing is for fast cars. Autocrossing is for fast drivers." I take it the wagon you are talking about is Scott's? Also, I believe it was the GT-R owners first autocross and in his defense he didn't do too shabby! I was in the S2000 when he tried racing me once and I just shifted into 3rd and casually drove past him while he was beside me riding the rev limiter. Haha douche. Man, and when I am out driving the sedan, I don't even get a second glance....WTF??!! It's because you need to put your wing back on. God that wing is a whore. I love my car.....I hate you guys for picking on it like that. See if I ever hang out with you guys again. Oh please Mike. You made 500+ horse. We have to pick on you. If it have blacked out windows and a front window banner that would be Josi on here's old whip. He sold it a littl while back to some chick. I don't what you are talking about. I don't even have a video of it. Last edited by Tommy; 12/25/2011 at 03:02 PM. What he said, I know Josi's old whip and his was Silver, this was SSBP that's the only reason it really caught my eye lol. Yeah, I believe it was Scott's. As far as being fair, you're right. A.) I've never even autocrossed, so my opinion really is moot. But....is there a definite date set for rallyx? We have not decided on a concrete date for the rallycross, yet. We have a membership meeting next Thursday and I will be sure to inform everyone about any dates we come up with. Most likely, I will send an update out to the Subaru Facebook group. I will make sure that everyone gets fair warning on when the date is for the event. Stay tuned! Anyone know the owner of the Black/Primer? eg coupe with greenish painted wheels that lives on SW 14th & Payton? Or the white da with black racing stripes and black wheels that lives on south union? The reason I am asking is because Ive been searching for a set of da gsr wheels and coming up with no luck or outrageous shipping prices. Both these cars have the rims I need (even though theyve both been painted) and would like to buy either set. Please let me know if you actually know one of the owners, and come help me get ahold of them. ^^ If I wanted to just show up to someones house, I wouldnt of asked if anyone personally knows them.